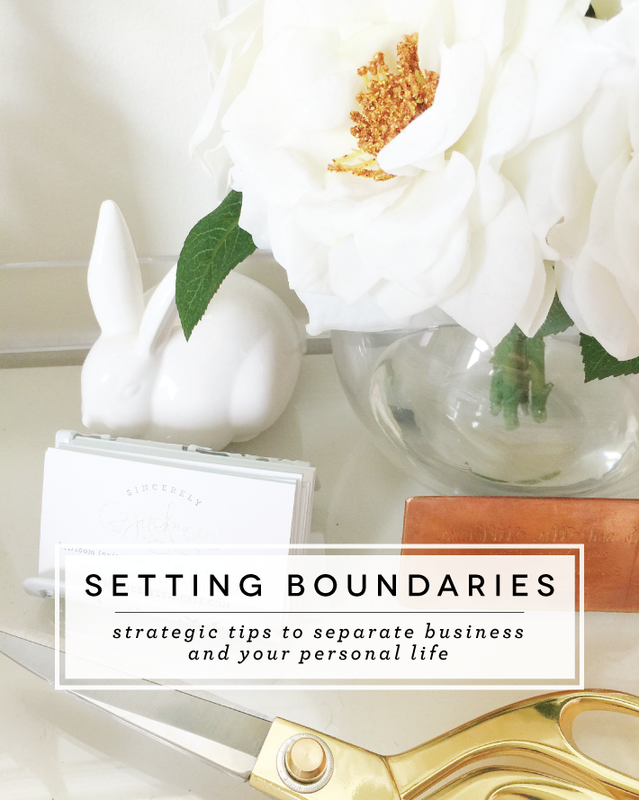 I've always thought that setting boundaries was a strength of mine. So much so, that I felt immune to the challenges many other business owners are often buzzing about. When I would hear a peer say "I check my emails 24/7, it's horrible! ", I would think, "well I do that, too, but since I don't dwell on what I see, it's OK". For the most part, I've always felt that I had solid boundaries in place. Maybe that was true, to an extent. I have an out of office that lets clients know it might take a while for me to reply, I don't (usually) answer emails during my "off" hours, have never had notifications or icons pop up on my phone, and I have no problem saying "no" to clients who ask for things I can't, or don't want, to take on. But, as with anything in life, I realized my boundaries were not as iron-clad as I intended. There were a few kinks here and there - answering emails late at night, checking emails last thing before going to bed and first thing when waking up, reaching out to clients over the weekend, responding to client texts (on my personal phone). It all felt manageable UNTIL a little blip happened while I was on vacation in early September, and it suddently dawned on me that I was NOT as in-control as I thought. Without going into the details, let's say that a client thought there was an emergency. While I was on vacation, I checked my email and responded to the client's emergency. It turned out to be a non-emergency, but I canceled four days worth of vacation plans to deal with the non-issue. Afterwards, I realized that, had I never checked my email in the first place, the whole issue would have come and gone, without me ever needing to intervene. I was so anxious after the whole thing and I dramatically stomped my foot and told my husband, "that's IT! I am turning off email on my phone!". And ever since then, my email gets turned off every single day from about 4:30pm-9:00am, and also at lunch time and on the weekends. It has been life changing. I feel so much more balanced and connected with both my business and my personal life. Knowing that I only have 8 hours during the day to deal with business helps me really focus on getting things done. At the end of the day, knowing that I cannot check emails, I feel like I am truly able to be present in my personal space. 1 - SET UP AN AUTOMATIC EMAIL REPLY. I have an auto-reply on that lets folks know I got their email and that I may take several days to respond. The email also includes general information, such as links to my website, links to purchase samples, and my office hours. Having this auto-reply has had a HUGE impact and allows me to spend more effort strategically planning my workload, and less time half-assing rapid-fire responses to emails. 2 - HAVE OFFICE HOURS AND MAKE THEM KNOWN. I have my office hours listed on my website, my email signature, and in my auto-reply. I also communicate my hours to my clients. For example, if a bride tells me she will provide me with information when she gets home from work at 7pm, I'll let her know that, since 7pm is after I close, I'll get back to her the following morning. 3 - STICK TO YOUR OFFICE HOURS. If you expect your clients to respect your boundaries, you need to respect them yourself. Do not answer emails or return calls outside of your posted business hours, and if you do, let your client know that it's a rare exception to the rule. 4 - ONLY PROVIDE ACCEPTABLE CONTACT INFORMATION. If you hate answering your phone, or if you only have a personal number and don't want clients to call it, do not give out that number. You can set up Google Voice for a business number that forwards to your personal number, or block your personal number. Additionally, if you hate answering to messages through your FB page, go ahead and turn off that function. Just make sure to give clients an easy way to contact you, even if it means stating on your website and social media that you ONLY reply to emails. 5 - TURN WORK "OFF". Like I mentioned earlier, literally turning my emails off every day has been such a huge weight lifted. I only turn off my emails, but I know a lot of people who turn off social media, too. I turn things off through my phone settings, but there are a lot of apps available that will do the turning-off for you. I've heard good things about FocalFilter and IFTTT. Those are my tips, and the things that work best for me. Are there any things you do to protect your boundaries? I would love to hear them!